Today’s warehouse is far more than just a facility in which to store inventory. Leveraging the latest supply chain technology and the Internet of Things (IoT), a “smart warehouse” can now serve as a hub to boost efficiency and speed throughout the entire supply chain. From wearables on workers to sensors and smart equipment, internet-enabled devices and technology can profoundly change logistics management. Logistic Management Magazine’s Warehouse/Distribution Center Equipment Survey showed an optimistic attitude among respondents who work in manufacturing, warehousing and distribution. The biggest areas of growth were automated storage and retreival systems, warehouse control system software and warehouse execution systems — all critical components in the creation of the modern smart warehouse. There are many advantages to creating a smart warehouse with the latest supply chain technology. Devices, sensors and radio-frequency identification (RFID) tags can enable warehouse managers to know the exact location and progress of any product at any time. “Hands-free” wearables can allow workers to move about and access information and instructions from anywhere in the warehouse without being constrained by workstations. Additionally, investing in IoT technology can reduce the use of manual labor, increasing speed and shipping accuracy, and offer retailers an opportunity to obtain unparalleled visibility into inventory and supply chains. 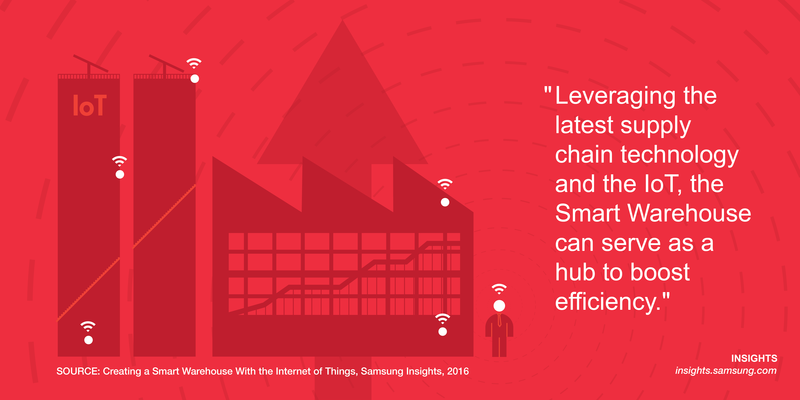 Many companies are already experimenting with IoT to create smart warehouses. UPS is using smart glasses in test programs to reduce the amount of labeling on packages. Athletic sportswear company Lids is using an Internet of Everything (IoE)-based robotics system to make its warehouse more efficient, with robotic carts that pick products, place them in bins and deliver them to workers. On a larger scale, many companies such as Amazon are now even using autonomous robots in their warehouses. Of respondents in Logistic Management’s survey, 39 percent are moving forward on investments in technology information systems, compared to 40 percent in conveyers and sorting equipment and 25 percent in robotcs solutions. One of the key challenges in the IoT-enabled warehouse is execution, and ensuring that the warehouse management, warehouse control and building automation systems (WMS, WCS and BAS) can break out of their traditional silos. For successful IoT deployment, all of these systems must be able to integrate and share information. Warehouses that want to implement IoT technology need to establish a system that supports both legacy and new smart devices, as well as multiple connectivity options. They should also consider device management and security, along with the possibilities for application programming and analytics. On the ground in the warehouses, it’s important for workers to have the right kind of devices — rugged tablets chief among them — to collect and interact with the datastreams coming from connected devices. While consumer-grade devices can manage the data, rugged devices stand up much better to the challenging and difficult environment of industrial settings. But IoT applications don’t have to be expensive or entirely revolutionize warehouse operations. IoT can also be used for simpler things such as building control and monitoring systems to reduce energy consumption in everything from light fixtures to HVAC units. Because they can greatly improve operational and systems efficiency, the IoT can have a ripple effect throughout the entire logistics industry by reducing costs and speeding up the movement of goods from warehouses to stores and consumers. Now is the time to explore how the latest supply chain technology can be used to create a smart warehouse. Learn more about how the Internet of Things is helping to streamline retail operations here.